Optometrists reveal secrets to success with over 100,000 eyewear styles, 100% price guarantee and excellent, customer serviceAustin, TX - July 31, 2012 - Today, the eyewear specialists at FramesDirect, www.framesdirect.com, announced that they hit the one million mark in providing prescription eyeglasses and sunglasses to customers worldwide since 1996. Founded by optometrists Drs. Dhavid Cooper and Guy Hodgson, FramesDirect.com credits their success to offering the largest selection of authentic, brand-name eyewear anywhere with quality lenses, competitive prices and excellent, customer service. "When we first started out, it was difficult, expensive and time-consuming for patients to get a good selection of brand-name prescription eyeglasses and sunglasses so we looked to online technology for an alternative solution,' states Dr. Cooper. "We wanted to offer a huge selection of eyewear with competitive pricing for everyone, but at the same time, it was essential to provide excellent customer-service. Our traditional values and experience in optometry set us apart from the competition and have enabled us to be successful, even in tough, economic times." Customer testimonials, industry credentials, top ratings, and more. Founded by Drs. Guy Hodgson and Dhavid Cooper in 1996, FramesDirect.com is an Austin, Texas-based eyewear company that operates on the following core principles: 1) Excellent customer service, 2) Use only the highest quality lenses, 3) Provide the best selection of authentic name brand eyewear, 4) Sell eyewear at a fair price without sacrificing quality. These principals have made FramesDirect.com one of the most successful online eyewear companies in the world with over one million customers. Find out more at FramesDirect.com and The Eye Zone, the company's official blog at framesdirectblog.com. 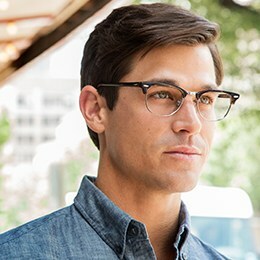 For more information on prescription eyeglasses and sunglasses, please visit www.framesdirect.com, or call one of our expert opticians at 1-800-248-9427. Related pages & posts: Top Eyewear & Optical Tools, Vision Prescriptions for Babies â€" How?, Eye Exam Coming Up? Read On, Reading Glasses, Video: Measuring Pupil Distance, Military Discount Eyeglasses, Trendy Eyeglasses, Discount Eyeglasses, Stylish Glasses for Women, Unique Eyeglass Frames.